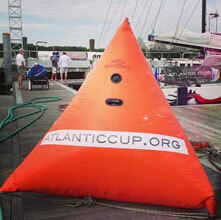 Atlantic Cup Inshore Racing & Last Day Recap! 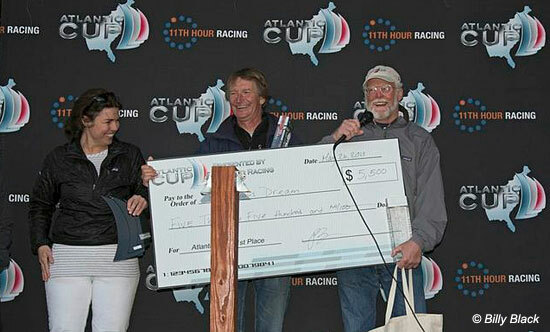 The 2013 Atlantic Cup is over and Bodacious Dream had a fantastic run of it … placing first in the two offshore legs and a respectable second in the third element, the inshore series, which combined to put us at the top of the leaderboard and first overall in this year’s event! Sunday was the last day of the competition, and it arrived with weather similar to how it was for Saturday’s last race, which we won. 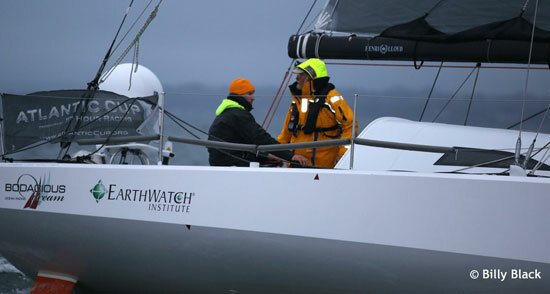 Wind speeds were again between 18 and 25 knots with an overcast sky, though fortunately no rain. Racing in “sporting” conditions like these is always challenging … physically as well as mentally. The decisions come even quicker and the pure physical energy needed to handle sails in such wind jumps exponentially. Along with that, your chances of making mistakes that can cost you places, goes up as well. 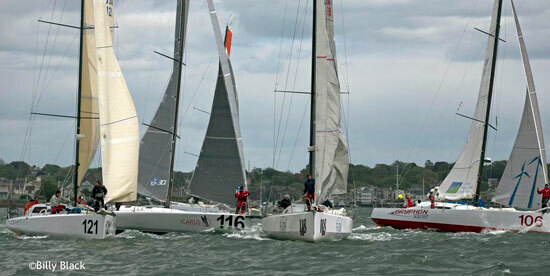 Often these regattas are won by whatever boat makes “the second to the last” mistake. There were plenty of mistakes made out there on the water, and we certainly had our share. One such costly mistake happened on the last turn to the finish during Saturday’s final race. 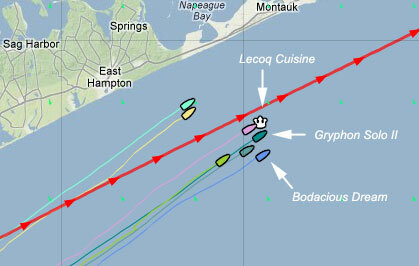 We were chasing down Lecoq Cuisine who had the lead, when they had a problematic spinnaker takedown while rounding the mark. Their spinnaker caught the water and began dragging behind the boat, which allowed us to pass them and continue on to win that race. This is all part of what makes racing so exciting to watch, but what also makes it painful when it happens to you or to a tough and valiant competitor. Going into Sunday’s races, we remained in the overall lead, but again we had to keep even or ahead of Lecoq Cuisine in the day’s two races in order to preserve it. Our plan was simple … race hard, not let Lecoq get ahead of us and solidly cement our place at the top of the standings. We started the first race in a very good position with water ballast in place for the long starboard sail to the first mark off Beavertail Point. I’m pretty sure we were the only ones with water ballast loaded, as we saw Bo surge ahead when the heavy gusts of wind hit, leading the entire fleet around that first mark in what was a rather tricky, high wind gybe. This is a maneuver that can really go wrong if everyone doesn’t do their job exactly on cue. We pulled that mark off perfectly, and then set up our Code 0 sail, an asymmetric sail designed for a broader angle to the wind. With the sail up and rolled, ready to be deployed, we delayed the decision to deploy it as the winds were still in the high 20’s. All of a sudden, on its own, the Code 0 unfurled and took to the wind, jamming the furling line in the process. This meant we suddenly had way too much sail area up. Crewmember Ryan Scott and I moved quickly to the foredeck to get the sail partially furled and dropped back to the deck where we got it under control. Not only can a problem like this cost you places in the race, but it can cost you personal injury and broken gear as well. We were lucky and only lost three places on that one. We stashed the sail below, but it remained unusable for the rest of the race. We sailed extra hard for the rest of that particular leg and rounding the next mark, we were again headed upwind – certainly one of Bodacious Dream’s very good points of sail. With Lecoq ahead of us after the Code 0 mishap, we set to sailing the upwind leg as perfectly as we could, and so were able to pass them halfway up that leg! Now back in third place, we chased the leaders all the while keeping Lecoq behind us. 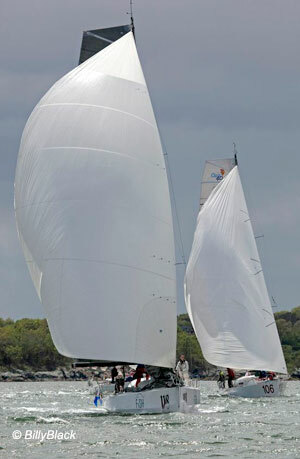 We jib reached down to the last turn mark, where we had Bodacious Dream doing over 19 knots across Narragansett Bay. Quite the thrill for all of us that was! Later, we learned that the camera boat was having a tough time keeping up with us! We turned the last mark, set our A3 spinnaker and sailed to the finish, taking a third behind Gryphon Solo 2 and Icarus, but leading Lecoq and gaining one more point on them. Our confidence was high going into the second and final race, and we got a great start which put us ahead of the fleet to the first turn mark … at which point we made a tactical error, which dropped us behind three boats and into fourth place. Frustration almost always leads to determination, and we got our focus together enough to pass two boats on the way to the next mark – one of which was Lecoq! 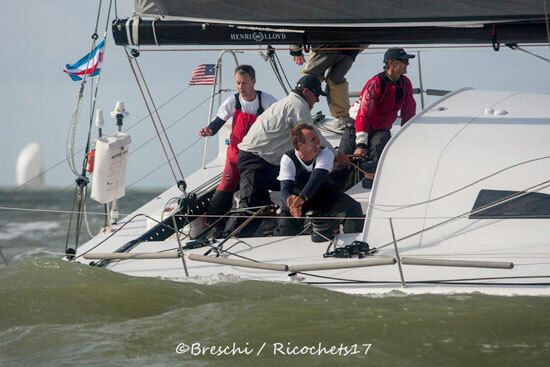 In second position now, we saw that our job was to sail perfectly around the course and to stay ahead of Lecoq. In similar circumstances on Saturday, we did just that, even nearly pulling ahead of Icarus at one point. As we crossed the finish line in this final race of the competition, we knew we had done the job, and cleanly won the overall event with a solid second position in the inshore series, on top of our two closely fought victories in the offshore legs. Worn out, tired, beat up by the windy days of racing, we were all elated and feeling victorious on our return to the harbor. My abiding appreciation to our hardy inshore crew: Jay Hansen, Jay Cross, Christer Still, Skip Mattos and Ryan Scott, and of course to Matt Scharl for his stellar tactics and fortitude on the offshore legs, all of which combined to bring Bodacious Dream to the podium at the awards ceremony Sunday afternoon to collect her first prize overall in the 2013 Atlantic Cup! Not only that, but thanks to you, our loyal fans, we also carried the vote for the “Most Popular” team! What an extra kick that was! My heartfelt thanks to all of you Bodacious Dreamers out there for supporting us, following us and sharing in this great event. My congratulations as well to an amazing international group of competitors who gave it their all with some consistently great sailing. The special camaraderie that we all shared here in American waters makes this event a standout event worldwide. We send out a challenge to our friends across the oceans to come prepared for some great racing next year! A special thanks to Julianna Barbieri and Hugh Piggen of Manuka Sports Management and 11th Hour Racing for making this event a truly spectacular one! That’s it for the moment. It’s time to go give Bo a wash-down and find her a place to stay for a couple of weeks, while I head for home to catch my breath and recover from the amazing events of the last three weeks. We’ll be adding photos to our Facebook page and right here on our website soon … and I’m sure I’ll have another story here in a day or two, so stay tuned for more coming right up! - Dave & the Bodacious Dream Team! 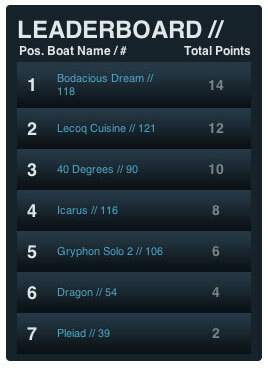 BoDream holds “slim” lead after 1st day’s “inshore” races! Well, that was ONE wild and exciting day on the water, full of great and very close racing! 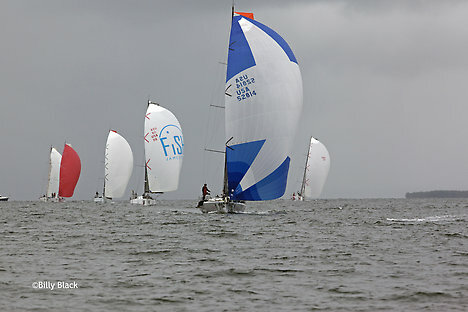 The first day of the Atlantic Cup‘s “inshore” leg played out against dark skies, white caps and strong winds. There were three races today that produced many lead changes and a mad mix of finish placements. Mistakes were frequent from everyone … so just when you thought you’d lost the race, someone else would make a mistake … and bam! – you were right back in it! Through it all, our crew was unstoppable – even though at times it was more like hand-to-hand combat than sailing! But they never gave in, and every time we did things right, Bo just kicked up her heels and danced! Huge smiles all around … though everyone’s pretty whooped and sore at the moment. But it’s an exhilarating feeling too … being that focused and in sync with each other. Thanks to all the guys (Jay C., Jay H., Christer, Skip & Ryan) for giving it their all. We’ll be back and fighting again tomorrow! So, here’s the RECAP! 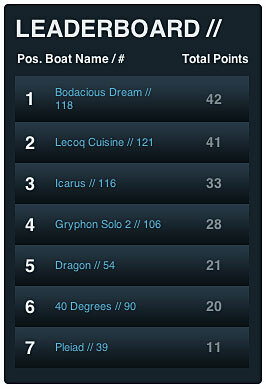 At the end of the day today, #118 Bodacious Dream was ONE “squeaky” point ahead of #121 Lecoq Cuisine and nine points ahead of #116 Icarus third place. After finishing 3rd and 6th respectively in the first two races today, we kept BoDream holding steady through the third race, outlasting and finally passing Lecoq Cuisine and GryphonSolo2 to win the last contest which put us back in the overall lead. Watching the live race tracker and listening to the live audio commentary is definitely the way 2 go! And that’s it for now … rest is calling! Onward to the final two races! Good luck to all the competitors! … And thanks to all of you! 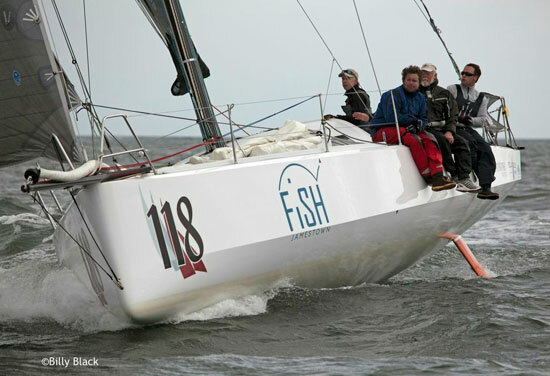 Atlantic Cup Leg 3 – Inshore Racing! 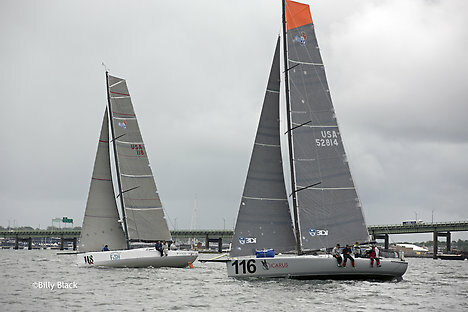 It’s Friday in Newport, Rhode Island and the weekend forecast for Leg Three of the Atlantic Cup looks to be for some spectacular sailing … and for some not-so-great weather. Saturday will likely dip into the 50’s with a strong chance of rain, Sunday in the 60’s with a little less rain predicted – and the winds both days up there close to 20 mph. So, it looks to be a challenging and a bit of a wild event for sure. A number of people have asked me about the difference between “offshore” and “inshore” racing. So, I thought I’d try my hand here at explaining what makes them different … and how inshore action adds to the overall scope and excitement of the competition. 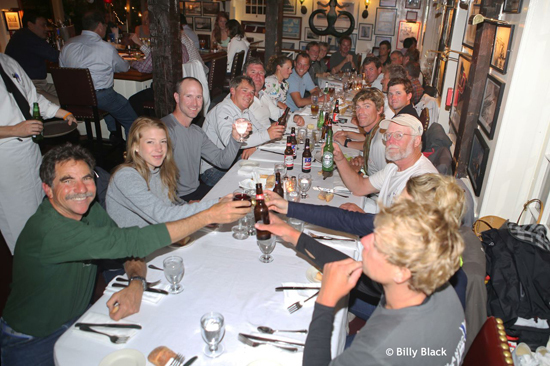 “Offshore” racing is open-ocean racing – from a starting point to an ending point, and it’s what we did on both Leg One (Charleston, SC to NYC/ 640 miles) and Leg Two (NYC to Newport, RI /240 miles) of the Atlantic Cup. 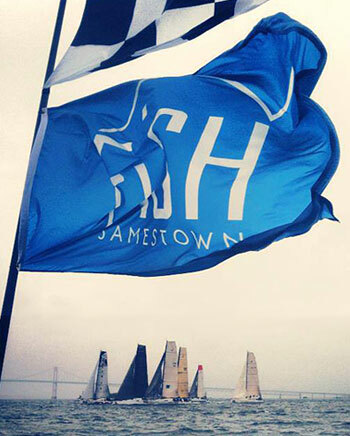 “Inshore” racing is course racing, and it’s what we’re doing this weekend on Narragansett Bay. As it involves so many quick and difficult maneuvers, each of the boats will have up to 6 crewmembers onboard. As Matt Scharl had to take off for the Midwest (Thanks Matt for an incredible job!) for this next leg, I will be joined by Jay Cross, Jay Hansen, Christer Still, Skip Mattos and Ryan Scott – stout-hearted competitors and experienced seamen, each and every one! There will five races over two days … with all seven boats in each race – and assuming we complete all five races, each team gets to keep their best four finishes. These are typically very short races, 15 miles or so in overall distance on a mapped-out course around a series of buoys in the bay, with the legs themselves often less than 2 miles in length. Here’s how the races are set up. There are a number of “marks” of the sort that the government places in harbors everywhere, so that ships and boats can navigate around them and so avoid rocks and shallow areas. These, along with other marks that the race organizers place in the water (like the one to the left,) are all the potential markers for the course. At the start of the race, the AC Race Committee notifies us of the particular course they want us to run, and they give us a sheet with all the marks in order for that particular race. An easy example might be a triangle race around three marks finishing back at the start. Another race might be 10 marks, that on the sheet looks like one of those Chinese string games we played as kids! The scoring of the Atlantic Cup is based on a high-point total with the offshore legs each weighted at double points, while the inshore legs are each weighted in single points. 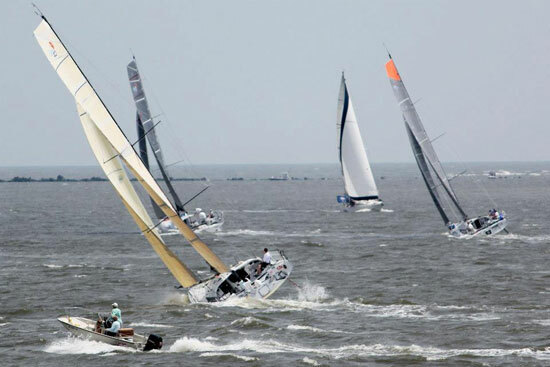 Essentially, the inshore races with only one times the points will still equal half the available points in the entire competition … so it remains very important to do well in these inshore races. As far as the bottom-line on scoring goes for us, for the inshore leg, Bodacious Dream has only to stay next to Lecoq Cuisine to finish in the lead. We don’t necessarily have to win a single race to take the title – but you can be sure we’re going out there to win them all! The scoring here is pretty complicated I know, but this is what makes sailboat racing so interesting; it’s not just about going fast and winning. There is a lot of strategy involved – which you saw in abundance on Leg Two. Inshore racing works with a whole other set of variables, which add up to intense and non-stop action. For example, tomorrow we may well be changing sails before each turn. 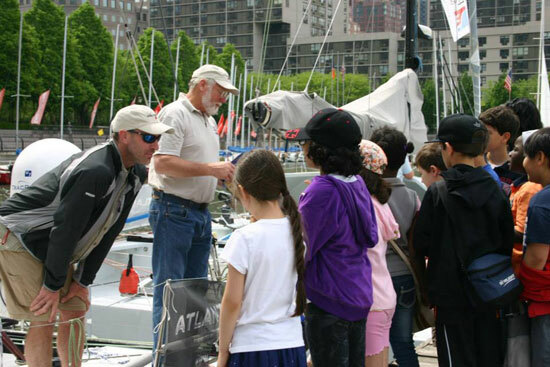 Changing sails is similar to changing gears in a car race … except it involves a heck of a lot more physical work! That’s also why the expanded crew … to handle all the additional work required to put the boats through paces that two-person crews can’t possibly do. Here’s a shot from last summer’s Class40 World Championships – where you can see some of the intensity (and ballet!) that goes on with a larger crew! So, here’s how a typical turn might play out. Let’s say you have a jib sail, the small triangular sail, up on the front of the boat, and you are going to replace it with the spinnaker, the larger, often colorful and billowy sail better for going downwind. You’re sailing at 7.5 knots (making each mile about 8 minutes long,) so this first leg will take you about 15 minutes before you need to make the turn of the next mark. At about the halfway point, you start to set up for your change. The new spinnaker is hauled up onto the bow of the boat (it weighs about 35 pounds!) Next you pull the sheets (ropes) around to tie onto the sail, and then next you move the halyard (the rope that pulls the sail up to the top of the masts) into position and hook it onto the spinnaker. When the boat arrives at the perfect spot – maybe 100 yards from the mark, everyone breaks into motion. The guy at the mast is hauling up the halyard, the guys in the cockpit are pulling in the sheets and setting up the corners of the spinnaker, the driver is driving the boat and the trimmers are still trimming the jib! Oh, and I forgot to tell you that there is usually a boat on either side of you doing the very same thing, but trying to do it faster than you are. If you’ve timed it right, the sail is at the top of the mast at just the moment your driver turns around the mark at which point, the sail (gloriously) fills with air, the guys in the cockpit trim it in and you sail away – except now you are going 10 knots, which means the next turn is only 12 minutes away, which means you no sooner finish one sail change than you are back setting up for the next – which is pretty much what you are doing the whole time you are on the water. At the same time, you still have to think in terms of your overall position on the race course. Positioning for inshore racing involves finer adjustments and much less distance between boats – which can get hair-raising sometimes too. So, to sum it all up … this weekend is going to be quite a thrill! The winds will be solid, the rain will be often, we will likely get wet before we grow tired, cold and frustrated – but at the same time, we will be loving it all and going for it each day in every race! We hope you’ll be able to follow us on the Race Tracker (once live, the link will be here,) on our Website, on our Facebook Page or on Twitter – updates to which we’re expecting will be coming fast and furious. It’s been a slow morning here in Newport. I’m tired and relieved, my hands are sore and my joints are stiff, and I’m feeling a few assorted aches in places I’ve never felt them before, but put all that against the thrill of winning the Second Leg of the 2013 Atlantic Cup, and it all feels well worth it! 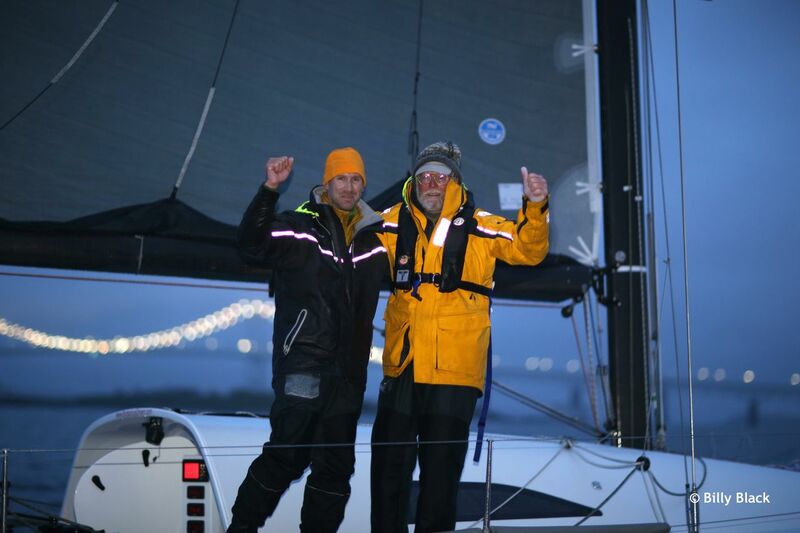 In case you hadn’t heard, Matt Scharl and I aboard Bodacious Dream were first across the “Jamestown FiSH Finish Line” at 8:14 PM EDT last night. And boy, what a race … and what an incredible bunch of competitors! The 14 of us have proven to be a absolutely tireless group of competitors on the water, and an equally dedicated group of friends off the water. Last night, after waiting on the dock for 45 minutes for all the boats to cross the finish line and tie up (Yes, all 7 boats finished the 240-mile course within 45 minutes!) – we all wandered over to a nearby restaurant for burgers and a round of friendly jabs and stories; a bunch of smiling, sleepy, squinty-eyed, wind-burnt faces all laughing about our lives! With a race as brief and intensely competitive as this one, you have to stay on yourself to run hard the whole time, so that when any opportunity to advance presents itself, you are right there to grab it! In the early part of the race, on our way south along the Jersey Coast to the turn mark off of Barnegat’s Lighthouse, we kept ourselves busy trimming the sails, driving the boat and managing the course. Being in the lead at that mark only meant that we had to pay particularly close attention to where our competitors were heading, and so try to position ourself between them and the finish line, still some 200 miles away. This is not always as easy thing to do as it sounds. 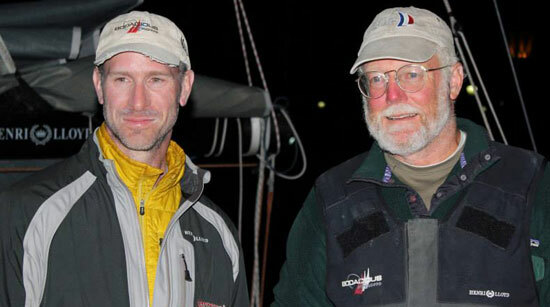 Later that night, as we moved north, the rain grew heavier so that keeping track of the lights of our competitors, mixed in with those of commercial fishing boats, became a big challenge. We watched as three of the boats headed to the west and three stayed with us. When morning came, we saw that Gryphon Solo II had shifted across the racecourse and had captured the lead from us. At that point, weather conditions became more intense, as we tried to position ourselves relative to Gryphon Solo II, but also somewhere where other boats couldn’t get past us. This kind of thinking doesn’t sound completely rational I know, but protecting second place was important for us, as the scoring for this race is cumulative over three events, not just one. At the same time, we were keeping an eye out for any opportunity to recapture first place. That opportunity came as we approached Block Island. The important decision to go either right or left around Block Island is always a tricky but crucial one. Currents and wind shifts play a big roll in your decision-making process. For us, the decision was to once again try to protect second place. Once Gryphon Solo II telegraphed their course and their decision to go to the right (east) of Block Island – (which seasoned local sailors will most often do) – we choose to stay with three other boats and head west around the island. A number of factors lead to that decision; wind, current, tides and that repeated urge to preserve second place all played a part … not to mention the fact that I had incorrectly entered a navigational point into the GPS, which lead us down a wrong path for a while. In a race of this speed and distance, there’s no downtime … you’re either ON it or your not. Once we committed to our plan to head left of Block Island, the opportunity presented itself to take over the lead once again. We worked some Midwest hoodoo to slip past Lecoq Cuisine, and then proceeded to sail as fast and furious as we could towards the finish, hoping that Gryphon Solo II had lost some ground coming around the eastern side of Block Island. For an anxious hour or two, we sailed hard, scanning the misty rain for sight of Gryphon Solo II. When they finally emerged from out of the fog, it was to our right and in a position slightly behind us, at which point we knew we had first place in hand! From there on, our first (and second!) order of business was simple enough … to keep going as fast as we could and to get to the finish line before anyone else. 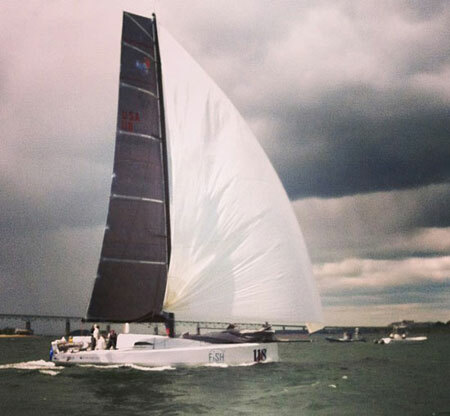 Just about an hour later, we entered the narrowing Narragansett Bay and crossed the finish line; exhausted, elated and excited at winning Leg Two of this incredible 2013 Atlantic Cup. This was also a repeat performance of our unexpected win last year! Matt and I are so very grateful for our great good fortune so far in the race. We hope you enjoyed watching the race on the tracker or following the updates on Facebook … and that you managed to ride the excitement and uncertainty that the race provided with its ever-changing position changes and close finishes. Today Monday is an official slow-way-down day. We’re heading down to the boat to do some sorting and cleaning … before meeting up with friends, finding a nice comfy chair and resuming our storytelling! 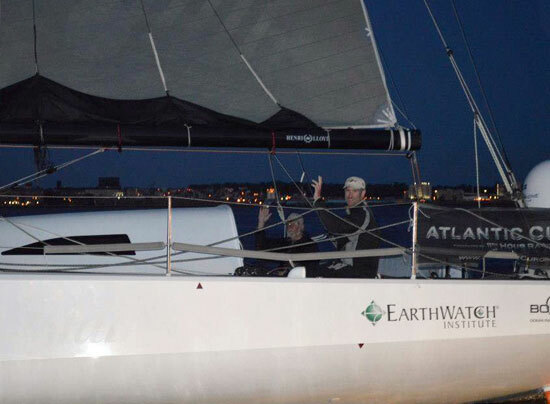 A big thanks to everyone who’s been a part of this, including our sponsors Jamestown FiSH, The Earthwatch Institute, as well as The Atlantic Cup Race organizers and staff and the many race sponsors. 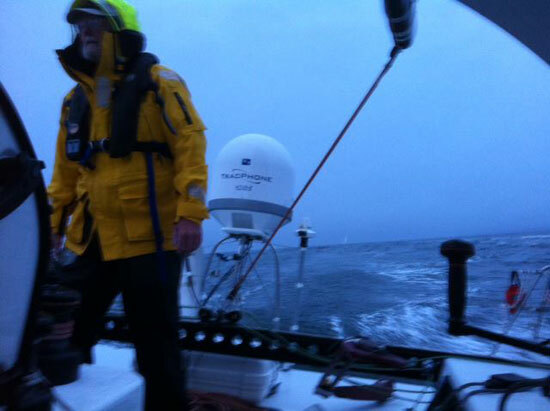 Thanks to Elizabeth, our onboard media person, who kept you up-to-date with our progress and with photos. Also a major bushel of thanks to Mark Petrakis over at Firm Solutions, for managing our online activities and our social media. Mark is the magic hand behind all the news you get! 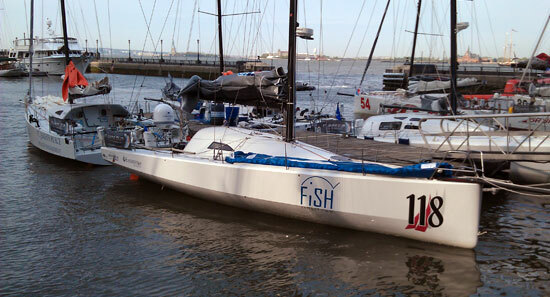 More recaps in the coming days, as well as updates on preparations for this weekend’s inshore racing leg. It’s not over yet! For now though, thanks again to all of you! Bodacious Dream was first across the finish line for the second leg of the Atlantic Cup Race! Matt & Dave crossed it at 8:14 EDT! It was a truly legendary race … and here are SOME of the reasons why. Lecoq Cuisine – who finished 8.5 minutes behind BoDream in the first leg – finished just 5 minutes behind them in this one! Gryphon Solo II finishes 3rd, just 10 minutes behind BoDream. We’ll leave it with BiG congratulations to all the teams in the race, to the race organizers and to the whole Bodacious Dream Team … for a job well-done, and of course, to all of you for your steady support! Leg 2/ An Out & Out Drag Race! Wow, what a race so far! 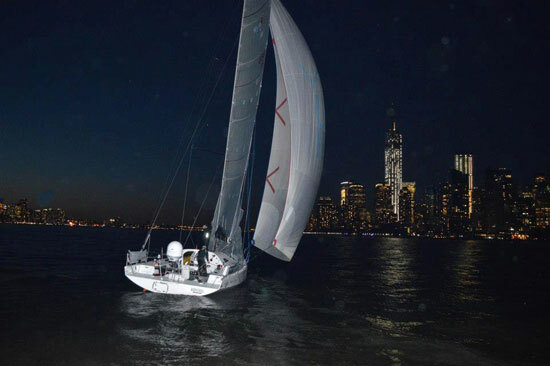 We started out in an unpredictable upwind heading out of New York City harbor with the winds going our way one minute and some other way the next. Then we had to pick our way through ferries, barges, ships, recreational traffic and the constant drone of helicopters, all of which made for some strange kind of energy. We made it all the way to Sandy Hook without tacking, and then were able to clear the point on one tack heading down to the turning mark off Barnett’s Inlet where we pivoted and headed back north towards Newport, RI. It was a neck and neck race with “Miracle Mike” Hennessy and Rob Windsor on Dragon keeping pace with us most all the way. We rounded ahead of the next group of boats, but only by a mile or two at the most. Through the long, damp, rainy night we changed sails, back and forth trying desperately to stay in the lead, but the fickleness of the winds kept us all guessing at who was out front. It’s now about 12:30 pm EST and though one of us might be in the lead right now, I wouldn’t count any of the boats being out of the running. We have approximately 45 miles left and it’s without a doubt, one of the best and tightest drag races I’ve ever sailed. Just to our left are the pesky gents on Gryphon Solo II, and just behind them are our favorite Kiwi-French duo on Lecoq Cuisine AND between the three of us is 40 Degrees – with Peter the Great and Hanna the Greatest! Outside is Miracle Dragon along with the Rockers of Icarus along with the ever-present Prospects of Pleiad. 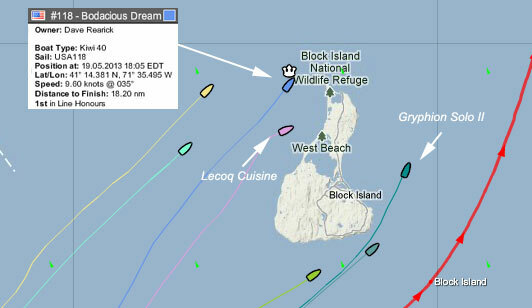 We also suspect those local boats have a trick up their sleeve for us when we approach Block Island. This one is going to be a nail-biter right to the end! It’s been full-on and neither Matt nor I have really slept at all or eaten much more than a handful of cookies, carrots or granola bars. Tension is high, which combined with excitement and adrenalin is making for an amazing experience. Stay tuned for more after the finish. I’m only taking a short moment here to update you all … and then it’s back to sail trim and sail changes! Atlantic Cup Leg One/ The End of the Race! Holy Cow! What a great race! And we won to boot!! 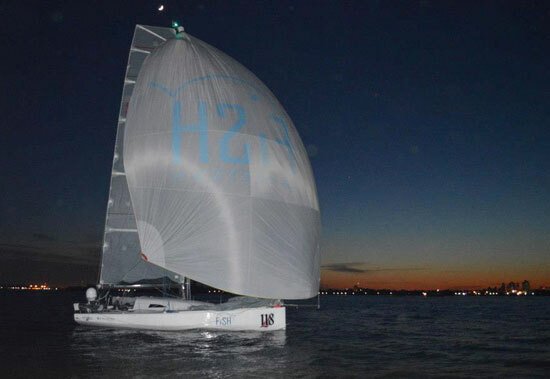 We sailed the last 24 hours knowing our two main competitors were both within 7 miles of us. Caught in a turbulent and unpredictable weather system, Matt’s mind was revving at full-speed playing out all sorts of different scenarios. Once we crossed with our competitors though, and knew what strategy cards they were holding, and which ones they were playing – we agreed on the perfect scenario for the situation, which was to do whatever it took to stay between our competitors and the finish line! 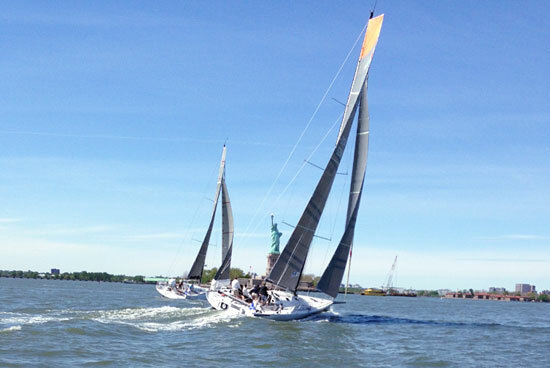 The 6 hours prior to coming into the harbor in New York City were pretty tense, as we could see Lecoq Cuisine and 40 Degrees directly behind us, closing the gap as they rode a new wind shift which was giving them a speed edge. At the same time, we knew we would eventually get that same wind, and so be able to hang onto our position. The wind eventually did increase, and when it did, it gave us a nice 20-25 knot push downwind to the finish. 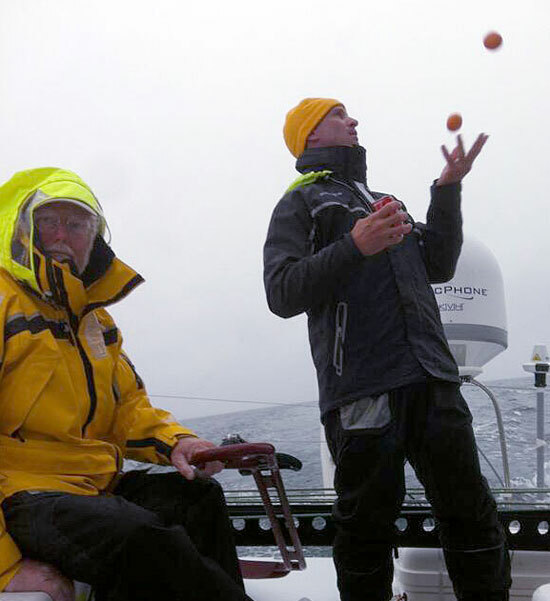 In the course of it, all we had to do was to complete three perfect gybes, which in such winds with a crew of 8 … is doable, but with only the 2 of us … well, it can put you into a kind of death grip and leave you with a helluva mess to clean up. Anyway, the first two gybes went well … but on the third, we had a mess-up when we found ourselves in a compromised position with a huge freighter that was bearing right down on us! Somehow, we cleared it and got out of the way just in time! And in all that, I found time to set up the video camera. I figured we had done two great gybes, and so I thought let’s video the third one to show people. So, during that third gybe, the video was running … right through our near screw-up. I’m planning on uploading that tonight … so stay tuned! Following that encounter, we opted to throttle back some, took the spinnaker down and put up the jib. 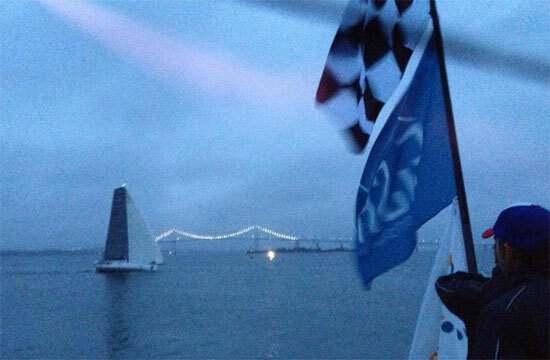 We worked our way to the finish, kind of in slow motion … surrounded by ships and pushed back by an outgoing tide. We knew Lecoq was gaining on us quickly towards the end, which forced us to put the spinnaker back up again and close it out that way. So, hang tight and we’ll have some videos and photos ready to share here soon. Bodacious Dream Takes First Leg of Atlantic Cup Race! BODACIOUS DREAM captures the first leg of the Atlantic Cup Race! … 1st across the finish line in New York City at 21:06:15 EDT! Total Elapsed Time to Finish … 79 hrs. I min. 15 secs. New York, New York – Such a winderful town! Braving all manner of obstacles, the guys managed to hold onto the lead position all the way from around Cape Hatteras, NC! 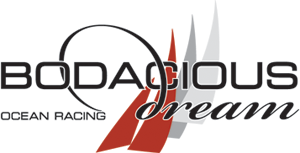 Way to dream it and live it … Dave Rearick & Matt Scharl … and the whole Bodacious Dream Family! #121- Lecoq Cuisine – 2nd across the finish line at 21:14:43 – (That’s an insanely skimpy 8.5 minutes behind Matt & Dave in a 3 day and 4 hour contest! Respect!) Then #90 – 40 Degrees finishes in 3rd position, arriving at 22:01:12. An AMAZING finish to an amazing race! Congrats ALL around! Once again, thank you everyone … for your ongoing confidence and support!